A belief that missile defense works when it doesn’t can lead to a devastating war. In this article, we first lay out the complexity of American missile defenses and explain why it’s way off the mark to believe U.S. ground-based missile defense interceptors are even close to as effective as Trump suggested. We then explain how overconfidence in national missile defense may tempt the president to consider a first strike with no actual guarantee that it can spare an American city — or multiple cities — from potential North Korean thermonuclear retaliation. For a president who has already expressed an inclination to visit “fire and fury” on Kim Jong Un and threatened to “totally destroy” his country, we’re obligated to take Trump’s misplaced confidence in GMD very seriously. His attraction to attempting a first strike will only grow if he is blind to an important gap in U.S. defenses. Not only might he still want to denuclearize North Korea by force, he might think it is actually possible to do so without putting the U.S. homeland at risk. U.S. strategic missile defense efforts, dating back to President Ronald Reagan’s Strategic Defense Initiative, have been colored by myth and overstatement. And if they don’t work now, it is always the fantasy of them working in the future that keeps the program going decades later. If North Korea were to fire an ICBM — or multiple ICBMs — at the United States, there is only one system that could take a shot at it. That system is GMD, which would launch its Ground-Based Interceptors (GBI), based at Fort Greely in Alaska, to attempt to intercept and destroy the warhead outside the earth’s atmosphere in midcourse flight. (Contrary to common misconception, other missile defense systems such as THAAD and Aegis are in no position to take a shot at ICBMs; they’re designed for other classes of targets.) GMD has been in development for more than two decades in anticipation of precisely such a threat. $40 billion later, GMD remains an immature system, though it became nominally operational in 2004. So, is GMD’s effectiveness anywhere near the number Trump mentioned? In short, no. In long, terms and conditions apply. There are two primary measurements of a missile defense system’s effectiveness. The first — and the most easily understandable — is the single-shot probability of kill (SSPK) for a given interceptor. Translated, this means just how likely a single U.S. GBI is to make contact with and “kill” an incoming ICBM warhead. Measuring this in itself is tricky. There’s a simple, but unsatisfying method: empirical success rate. In its 18 intercept tests to date, GBI has succeeded 10 times, giving it a roughly 56 percent SSPK. There are a few caveats that may raise or lower the probability of successful interception. GMD has matured as a system over the course of its testing, but it has only been tested once against an ICBM-class target — and not in a realistic environment with little warning, countermeasures, or a trajectory that looks anything like a North Korean Hwasong-14. Acknowledging these limitations, last year the Department of Defense’s Director of Operational Test and Evaluation was unable to assign a quantitative assessment of the system’s performance, but conceded it possessed a “limited capability to defend the U.S. Homeland” against IRBMs and ICBMs. On the other hand, the newer CE-II Exoatmospheric Kill Vehicle at the core of today’s interceptors likely has a higher assumed SSPK than the older CE-I variant, though this number is not publicly known. The second measure — the one more commonly used by advocates of systems like GMD — is the overall effectiveness of the system, with some assumptions about its operational use. The United States is not expected to take on incoming ICBMs one-for-one — where one interceptor is assigned to destroy one Hwasong-14 warhead. Instead, taking into account the shaky testing record and higher acceptability standards, the United States would fire four interceptors at a single incoming ICBM. Trump’s 97 percent number is a more attainable figure here. System effectiveness for n interceptors against i targets with k SSPK per interceptor is calculated using the expression (1-(1-k)^n)^i). Assuming four interceptors, a single incoming ICBM, and an SSPK of about 57 percent, the odds of a successful intercept scenario thus rise to 97 percent. This calculation, however, ignores the possibility that each successive interceptor’s chance of successful kill might not be independent of the previous one, due to correlated factors such as design shortcomings, leading to a lower overall success rate. Trump’s remarks, however, make it clear that he believes each interceptor has an SSPK of 97 percent (rather than 57 percent). Hence “if you send two of them it’s gonna get knocked out.” This is a wildly inflated — almost delusional — sense of how accurate the system is, and how many North Korean ICBMs it could potentially successfully intercept. Trump’s claim is almost correct if four interceptors are assigned per incoming warhead, not one. To get to “gonna get knocked out” (with >99 percent assurance), we would need to assign six interceptors per incoming warhead if each has an SSPK of 57 percent. No doubt the president heard either 96 or 97 percent effectiveness for homeland missile defense during a briefing, without realizing that this did not refer to the accuracy of each interceptor but to four against a single incoming ICBM. While this may seem like statistical nitpicking, the United States does not possess unlimited GBIs. This year, the GBI inventory will be expanded from 30 interceptors to 44. Assuming the four-per-ICBM concept, successive North Korean ICBMs begin to pose real problems. For instance, let’s imagine a scenario where North Korea fires at least 11 ICBMs, the number needed to exhaust all 44 planned U.S. GBIs. Assuming the empirical SSPK of 56 percent (meaning four interceptors gives you a 96 percent chance of destroying each ICBM warhead), we quickly arrive at an overall system effectiveness of just 66 percent. That’s a one in three chance of a U.S. city absorbing a devastating nuclear strike. Remember too that it will always be far cheaper — both in relative and absolute terms — for North Korea to add additional Hwasong-14s than it would be for the United States to add interceptors to the inventory or to improve the per-interceptor efficacy of the system. Eighteen Hwasong-14s would leave GMD in the realm of a coin-toss (an overall effectiveness of 50 percent). That means there’s a 50/50 chance that a North Korean thermonuclear payload would reach a U.S. city and kill millions. And this all assumes that North Korea does not employ penetration aids like decoy re-entry vehicles to effectively confuse they system into committing a large chunk of GBIs against dummies. This would leave fewer interceptors for an actual warhead, increasing the chance of a nuclear weapon penetrating the system. And if that isn’t enough to scare you, this should: Even if U.S. missile defense gets lucky and takes out North Korea’s missiles, the tyranny of geography means U.S. salvo launches of GBIs against North Korean Hwasong-14s might ignite a nuclear war with Russia. Simply because of where the U.S. GBIs are located in Alaska and the trajectory a Hwasong-14 would follow from North Korea to a West Coast city, U.S. interceptors may have to make midcourse contact over the Russian Far East. The GBI kill vehicle, though similar in appearance to a ballistic missile, does not carry any explosive payload, nor is it designed to reenter the atmosphere toward the earth. But that’s something Russia’s early warning systems wouldn’t and probably couldn’t account for — and we can’t count on a calm Stanislav Petrov-type who’d been keeping his eye on Twitter to know that the United States and North Korea were at war, and’ that the United States hadn’t just launched missiles at Russia. Thus, as the United States attempted with mixed success to fend off nuclear attack from North Korea, it might well create a misunderstanding in Moscow that started a nuclear exchange with the world’s other nuclear superpower. But aren’t missile defenses…purely defensive, you ask? Aren’t they designed to intercept North Korean ICBMs if Kim launches an unprovoked strike against the U.S. homeland? Well, that’s only half the story. Missile defenses have always been sold as defensive systems that are part of what are known as “damage limitation” measures. But here’s the dirty secret: Another purpose — indeed, probably their primary purpose — is to support offensive nuclear strategies and give the United States a so-called perfect or splendid first strike capability against an adversary. This fantasy of completely disarming an adversary in a first strike was dismissed by even Herman Kahn due to its infeasibility during the Cold War (but at times advocated by the likes of General Curtis LeMay against Cuba and the Soviet Union). Before missile defenses, if the United States were to attempt a first strike to disarm an adversary, it had to be sure it could account for, find, fix, and destroy every single nuclear system (or at least those capable of reaching the United States or its allies). If not, the remaining ones would certainly be used against the United States (or allies). It was a ridiculously impossible intelligence and logistical challenge, even against a small arsenal, since accounting errors alone exposed American cities to devastating retaliation. But working missile defenses relieve the pressure to find all of those enemy forces. You can theoretically miss a few, and then employ missile defenses to intercept those residual forces. In concert, missile defenses with a counterforce capability resurrect the dream of a splendid first strike. Such a strike seems especially plausible against states with only a handful of ICBMs, since only one or a few would be left after the United States destroyed most of the force in the initial counterforce campaign. Although U.S. missile defenses can easily be saturated by many incoming ICBMs and countermeasures, the hope was always that it could be effective against a residual force of only several adversary ICBMs. The system is therefore less threatening to states with larger arsenals such as Russia or China. In North Korea’s case, though, American counterforce strategy coupled with working missile defenses could spell the end of its nuclear arsenal. But there are two significant problems with this thinking. First, it doesn’t work! As we’ve shown, U.S. missile defense is not particularly effective even against a single incoming ICBM. 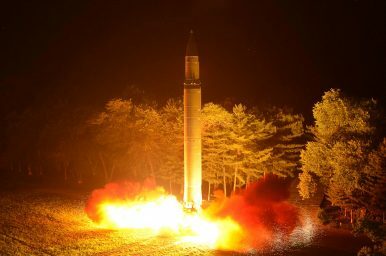 Proponents of a “splendid first strike” may argue that no more than one or two Hwasong-14s would survive a U.S. strike on North Korea — perhaps hidden deep in unknown underground facilities. Therefore, the overall GMD math might appear acceptable. But even a 3 percent chance of catastrophic damage to a U.S. city should still be unacceptable to any president. Indeed, we tolerate far lower risks for more mundane matters like civil aviation. The discrepancy between what Trump may believe to be the system’s efficacy and how well it actually works creates a very scary scenario. It increases his temptation to consider authorizing a first strike on the belief that, even if we cannot destroy every North Korean ICBM on the ground, GMD will surely be able to intercept what’s left for Kim to launch at the United States. It cannot. Overconfidence in the system makes it more likely that Trump may be tempted by a military option — a first strike attempt — that will very probably result in the United States losing one of its own cities to a North Korean nuclear retaliation. Second, if North Korea thinks Trump may be attracted to such splendid first strike options, it incentivizes Kim to take survivability and penetration measures such as building as many missiles as fast as he can, hiding and moving them around, and developing decoy reentry vehicles and multiple independently targetable reentry vehicles (MIRVs) to increase the number of targets that might confuse and penetrate missile defenses. And, most dangerously, it puts Kim back in first-strike instability mode with extreme “use it or lose it” pressures. If North Korea fears a surprise conventional or nuclear first strike might still be on the table and coming, Kim’s incentive is to launch all of his nuclear weapons preemptively. Pyongyang’s best shot of penetrating GMD is to fire everything it has — including all of its ICBMs — at the first sniff of a counterforce attempt so it can saturate the system and have some hope of getting a nuclear weapon past American defenses before they’re all destroyed. But wait, Vipin and Ankit, you told us earlier that North Korea’s ICBM was a third-strike weapon to be held in reserve, not a first-strike weapon? Yes, in the event of a conventional invasion where Kim has to just try to slow down the cavalry. In this scenario, his strategy is likely to be limited nuclear use against regional bases, holding the ICBM in reserve to deter American nuclear retaliation. But the prospect of a disarming nuclear first strike against North Korean nuclear forces is very different. In that scenario, Kim has no choice but to go preemptively and massively, including with any ICBMs he can get off — he cannot hold anything in reserve because he has to fear nothing would be left once the U.S. counterforce attempt was through. Put simply, if he fears not just invasion, but that he is about to directly lose his entire nuclear force, he cannot afford to go second. The more Trump is tempted by a splendid first strike option, the more Kim has to consider preemptively firing every nuclear system in his inventory. This is why Trump’s apparent overconfidence in American missile defense is so dangerous. The siren song of a “splendid first strike” may be too hard for him to resist. Trump’s beliefs about the likely success of a nuclear first strike against North Korea are especially important because he, and he alone, can singlehandedly order such a strike whenever he chooses. If he issues a valid launch order to the National Military Command Center (NMCC) via the “football,” there is literally no one who can stop him, and we need to assume that the strike would be carried out. Imagine that Kim tests a missile in the middle of Washington’s night and Trump is awake watching this unfold on Fox News. He thinks to himself, enough is enough. He opens the “biscuit” from his wallet, summons his military aide from the hallway and issues a valid order to target North Korea’s nuclear systems in a nuclear first strike. Any advisors that can talk him down are asleep. The NMCC transmits the authenticated launch order to STRATCOM and it is dutifully carried out as mandated. We have just initiated a nuclear strike and the survival of, for example, San Francisco, depends entirely on the U.S. missile defense system’s ability to intercept whatever Kim gets off in time. Is this scenario likely? Certainly not. Is there a chance it could happen, exactly like this? Yes. One thing is for certain: There is nothing splendid or sterile about such an attempted strike. First, Kim’s incentive is to do whatever he can to saturate GMD by going first and going massively if he thinks the United States is coming after his nuclear forces. Second, even if we could shrink the force to just a few ICBMs, it is wishing on a prayer that GMD could successfully intercept the incoming warheads amidst any countermeasures. Make no mistake: A very plausible outcome would be an American city in ruins at the hands of a North Korean nuclear weapon. It is time to stop fantasizing about denuclearizing North Korea by force — a fantasy spurred by excessive faith in missile defenses — and accept that there is no technological panacea for addressing North Korea’s nuclear and missile program. It is time to go back to tried and tested practices: diplomacy and deterrence. A denuclearized North Korea is not worth risking any American city on the deadly overconfidence that an untested missile defense system could save it from Kim Jong Un’s thermonuclear retaliation. Ankit Panda (@nktpnd) is a senior editor at The Diplomat and an independent researcher. Vipin Narang (@NarangVipin) is an associate professor of political science at the Massachusetts Institute of Technology. This piece originally appeared at War on the Rocks and is republished here with kind permission. Accidents involving two Arleigh Burke-class destroyers in 2017 will have serious consequences.